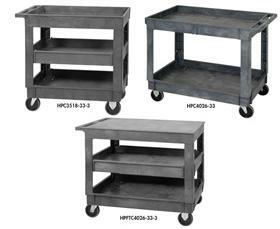 CHECK OUT THESE INDUSTRIAL CART SPECIALS WITH FREE SHIPPING! 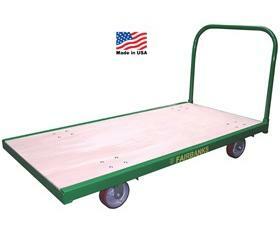 Rubber mat on top and bottom provides durable non-skid surfaces. 1 keyed drawer 12-1/2" x 18-1/2" x 4-3/4" with 2 keys included, 100 lbs. capacity. 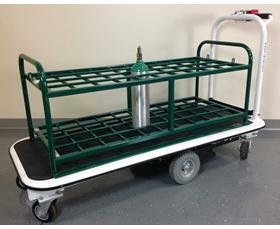 One unit comes with 5 x 1-1/2" polyurethane casters while the other comes with 8 x 2" pneumatic casters. 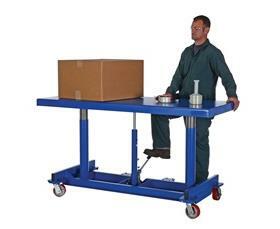 Pneumatic casters are better for rougher surfaces or moving from building to building since it reduces vibrations. FOB Shipping Point. 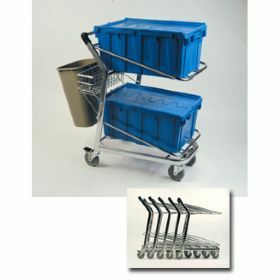 Plastic Mobile Carts. 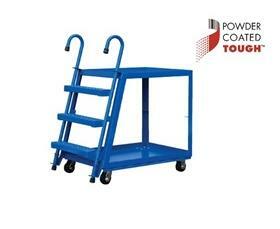 Ideal for many industrial and commercial material handling applications. 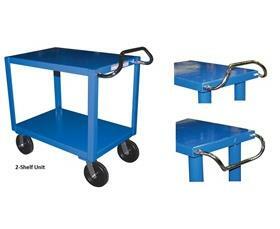 Cart comes complete with 2 swivel and 2 rigid 5 x 1-1/4" heavy duty casters. Available in 2 sizes. Color is Gray. FOB Shipping Point. <br> <br> See <strong>Related Items</strong> tab for accessories. 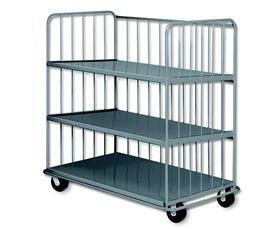 Made of all welded, heavy duty steel construction. 14 ga. steel shelves have lips down. All shelves have stiffeners. Built to handle loads up to 4000 lbs. Push handle provided. Rolls on four 6" x 2" phenolic bolt on casters, 2 swivel, 2 rigid. 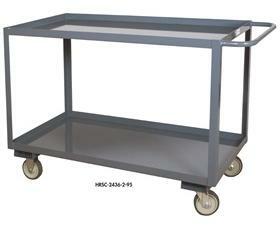 Durable Gray powder coat finish. FOB Shipping Point. Rolls loads of parts, supplies, cartons, packages right to the job site. 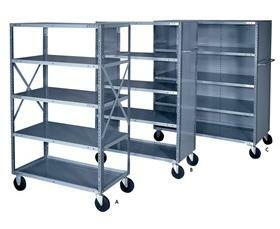 Features 1 – 18 ga. bottom tray shelf and 4 – 20 ga. shelves. 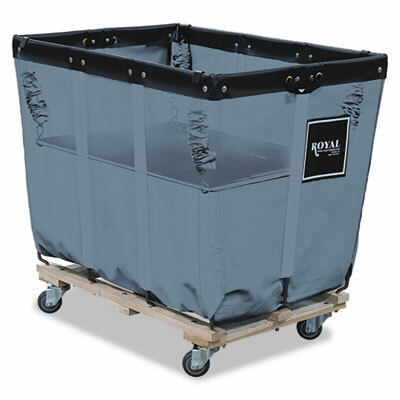 Designed to support loads up to 1000 lbs. 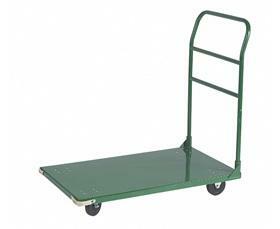 Includes convenient push handle for increased maneuverability. 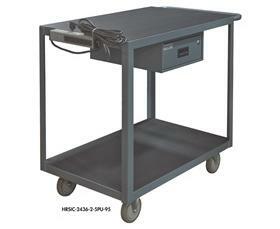 Rolls easily on 5" x 1-1/4" casters – 2 rigid, 2 swivel. Gray baked-on enamel finish. FOB Shipping Point. 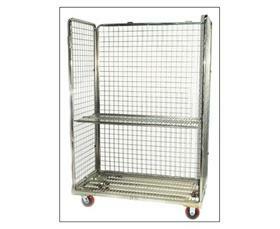 <BR><BR><STRONG>Open Type</STRONG>…features open sides for complete and free access.<BR><STRONG>Closed Sides Type</STRONG>…includes 2 end sides for added protection of contents during transport. <BR><STRONG>Closed-sides/Back</STRONG> <STRONG>Type</STRONG>…3 sided enclosure for maximum protection of loads. Ideal for small parts transfer. 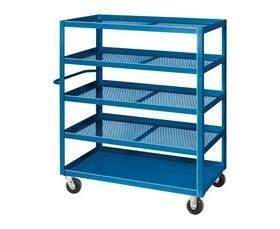 Exclusive ribbed formed base shelf increases carrying capacity. Heavy 13 ga. posts allow 1" shelf adjustment. Convenient push handle for fingertip control. 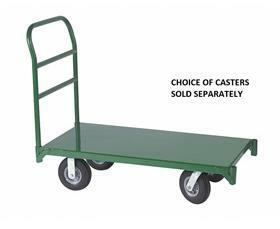 Easy rolling on 5" solid rubber casters (2 swivel, 2 rigid). 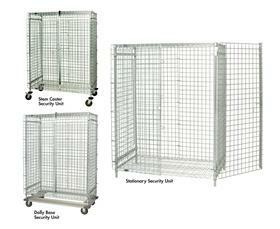 Available in open, closed ends or closed types. Gray finish. FOB Shipping Point. 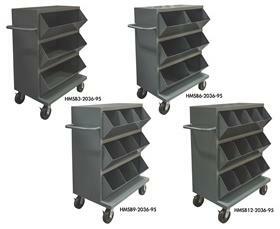 6 x 2" phenolic casters have a 3,000 lbs. capacity. 1-1/2" shelf lips up on all shelves prevent lost parts during transportation. FOB Shipping Point. 1,200 lbs. 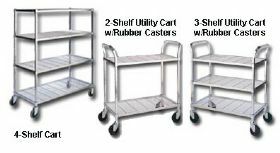 capacity trucks have 5 x 1-1/4" polyurethane casters and 1-1/2" shelf lips up on all shelves to prevent lost parts during transportation. 3,000 lbs. 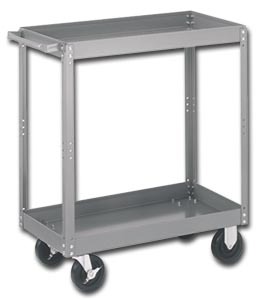 capacity trucks have 6 x 2" phenolic casters and have top shelf lips down. FOB Shipping Point. 1,200 lbs. 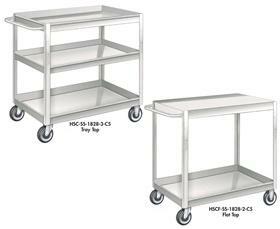 capacity trucks have 5 x 1-1/4" polyurethane casters and 1-1/2" shelf lips up on all shelves to prevent lost parts during transportation. 3,000 lbs. 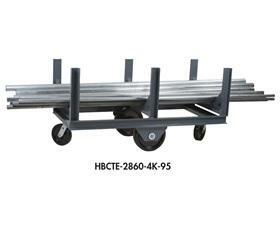 capacity trucks have 6 x 2" phenolic casters and have top shelf with lips down. FOB Shipping Point. Ergonomic handle has 3 handle points which provide a more comfortable grip and can reduce fatigue, injury, and lost time. 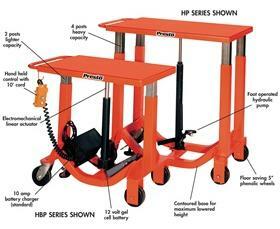 Units with 5 x 1-1/4" polyurethane casters have a capacity of 1,200 lbs. 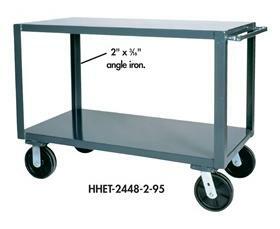 Units with 6 x 2" phenolic casters have a 3,600 lbs. capacity. Side brakes are included to keep unit locked into place when necessary. Shelf clearance is 26-3/4" and top shelf is 39" above the floor. FOB Shipping Point. 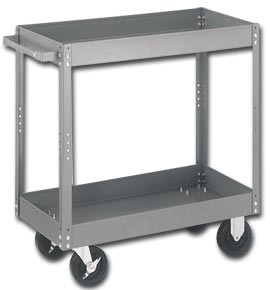 Units have 8 x 2-1/2" pneumatic casters. 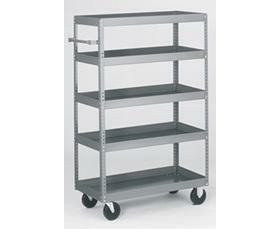 Shelf has clearance of 26", providing ample space for storage. FOB Shipping Point. Breaks down flat – reduces shipping costs! Features 5” x 6” wheels. 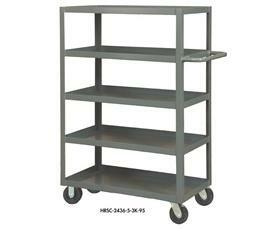 Measures 30”W x 51 1/2"L x 43-3/4"H. Ships UPS. FOB Shipping Point. 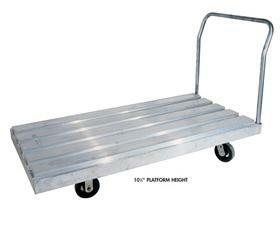 Rugged smooth deck Steel Platform Truck is ideal for all types of industrial and commercial work. 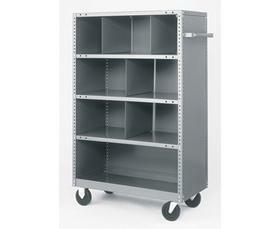 Features a "V" style pipe handle which helps prevent boxes, packages and inventory from falling off the back. Glass filled nylon casters. FOB Shipping Point. 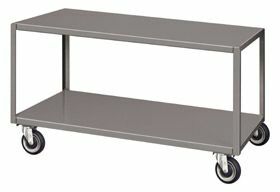 Steel deck is made of strong 14 ga. construction, reinforced with steel cross-battens for convenient handling of uniformly distributed loads up to 3500 lbs.&nbsp; Casters are bolted onto extra caster top plates welded underneath the deck.&nbsp;Handle included.&nbsp;Durable Epoxy Power coated finish.&nbsp;FOB Shipping Point. 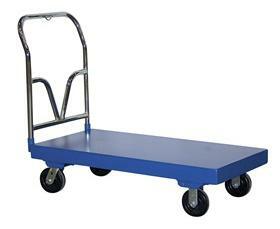 Rolls on rugged 5" x 2" Poly-on-Steel wheels. 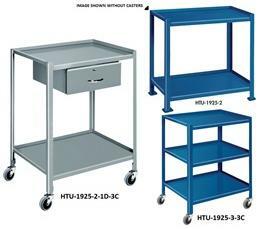 Call for additional sizes, capacities and caster options. FOB Shipping Point. Up and down jolts are smoothed to protect loads and floors...prevents caster damage. 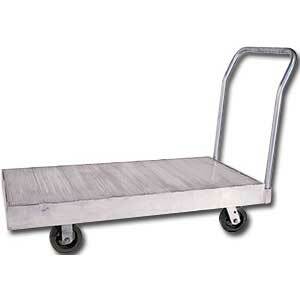 Smooth rolling on 5" x 2" Poly-on-Steel wheels (2 swivel, 2 rigid). 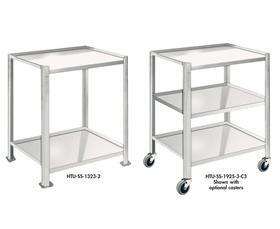 Call for additional sizes, capacities, and caster options. FOB Shipping Point. 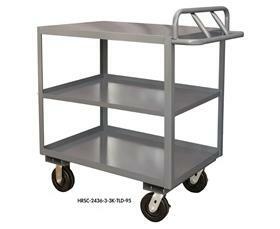 Safely handles loads up to 3600 lbs. 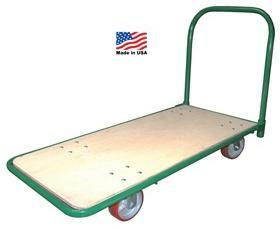 Smooth rolling on 5" x 2" Phenolic casters (2 rigid, 2 swivel). Glass&nbsp;filled nylon casters. &nbsp;FOB Shipping Point. 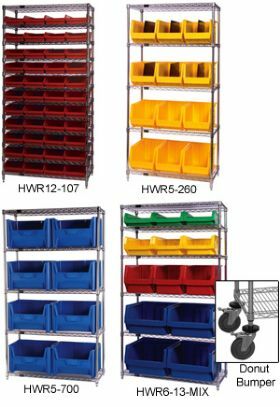 Identify parts easily with these durable Pick Racks which provide a high density, easy access, sloped shelving system which are available as a bench rack, single, double sided and mobile units. Systems sold complete with bins. 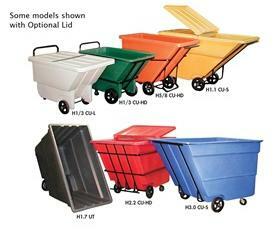 4"H. bins available in Blue, Yellow, Red, Green, Black or Ivory. 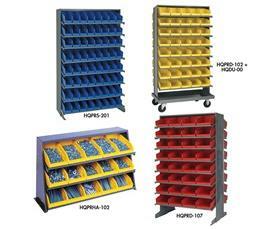 6"H. bins available in Blue, Red or Yellow. 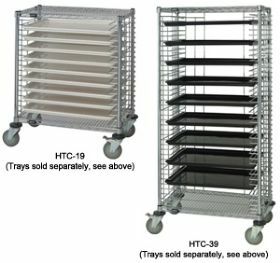 FOB Shipping Point.<Br><BR> Double Sided Units available as Mobile Units with addition of mobile kit, see <strong>Related Items</strong> tab. Bin opening incorporates a slope design of 6" high. 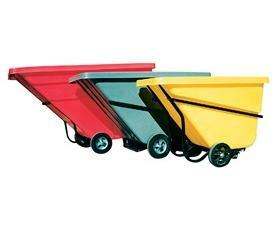 Choice of 3, 6, 12, or 19 open face bins. 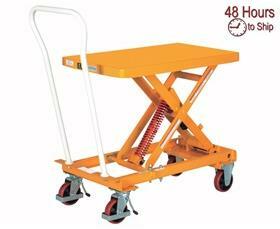 Has 6 x 2" bolt-on phenolic casters, 2 locking swivel and 2 rigid. Sturdy, tubular push handle. Top shelf is 49-1/4" above the floor. Shelf clearance is 13-3/8". Ships fully assembled, ready to use. FOB Shipping Point. 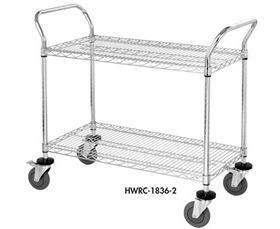 A step and work-saving cart that's perfect for order picking and stocking. 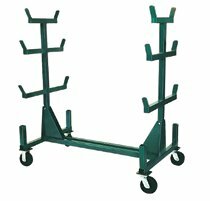 It's easy to reach high shelves with the handy three-step ladder. Grip-tread steps assure non-skid footing. 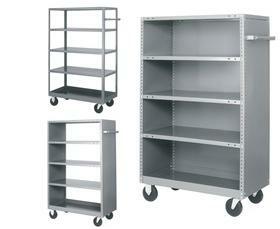 Long-lasting aluminum or steel construction is designed for maximum support and service. Trays have 2" high lips turned up. 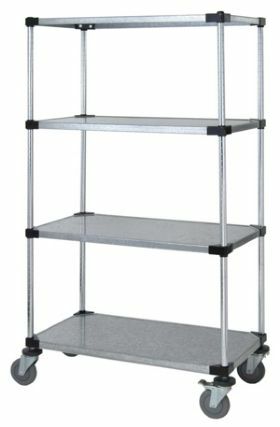 Available in either two or three shelf models. 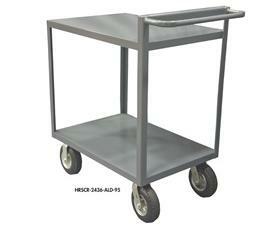 Rolls on 4 x 2" mold-on rubber casters (2 swivel with brake, 2 rigid). 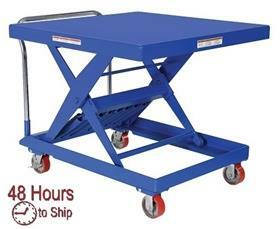 FOB Shipping Point.<BR><BR> Additional sizes and casters available, call for details. <br> <br> See <strong>Related Items</strong> below for more stockpicker trucks. 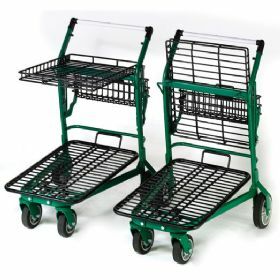 Order pickers built specifically for Crown and Raymond style machines for a level transition between the order picker platform and the cart deck, eliminating trip hazards. 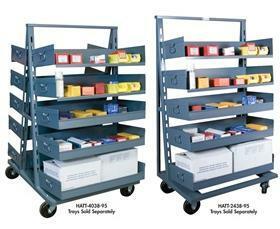 The carts are 47" wide by 60" long and have an optional tongue and rear hitch for pulling multiple carts at a time. 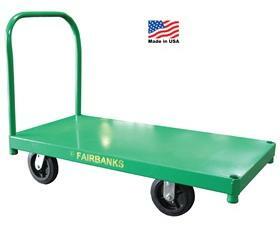 The carts have a 2,000 lb. 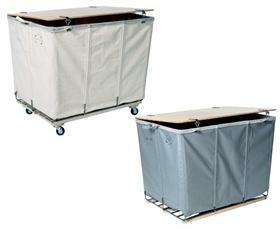 capacity rating with premium poly casters and precision bearings for easy rolling when fully loaded. A heavy duty floor lock is provided. 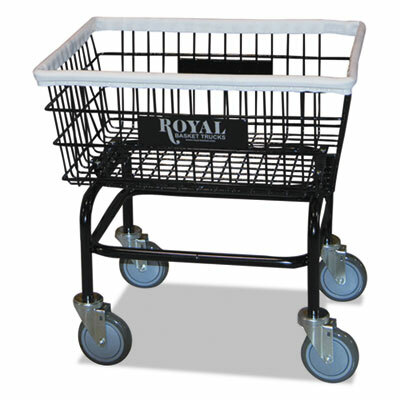 Crown style carts have a wood grabber bar while the Raymond style have a steel grabber bar. FOB Shipping Point. 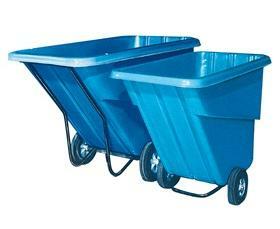 Larger capacity and molded body make these trucks lightweight and economical. 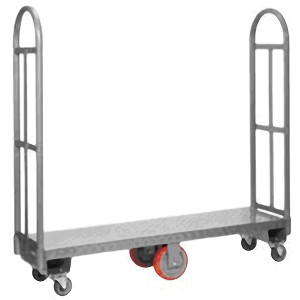 Molded wheel wells with inboard, high-quality wheels allow multiple units to nest for freight savings. Protects walls and doorways from impact damage. 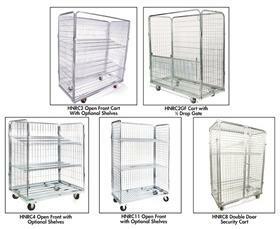 Optional hinged lids available for all 6 sizes, see <strong>Related Items</strong> tab. Available in Gray, Blue, White, Red, Green, Yellow, Black or Orange body colors. 3.0 cu. yd. models in Gray only. FOB Shipping Point. 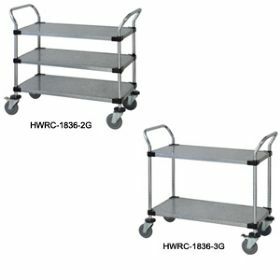 This rugged cart is&nbsp;made&nbsp;for rough terrain usage with oversized 8" rear&nbsp;and 6" front wheels.&nbsp;Available in Dark Grey/Black or Green/Black - please specify color. Ships UPS. 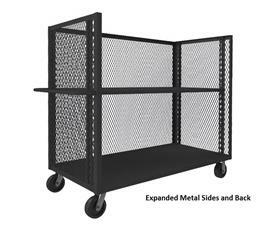 FOB Shipping Point.<BR><BR><EM>Comes with&nbsp;Rear Basket</EM>.<BR><BR><STRONG>Rear Basket<BR></STRONG>Measures 19"W x 5.5"D x 6"H.&nbsp; Black VersaCoat finish. Increase efficiency while reducing potentially harmful bending or twisting motions. Easy tension adjustment for height/weight sensitivity. Removable bolt handles. 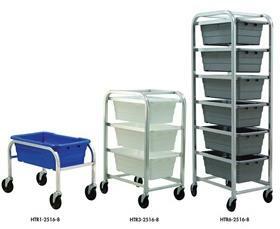 Rolls on 5" x 1", 2 rollers rigid, 2 swivel casters with brake stands. 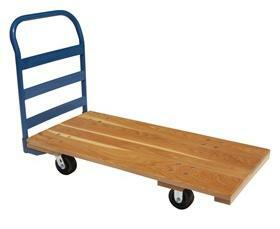 Handles loads up to 800 lbs. FOB Shipping Point. 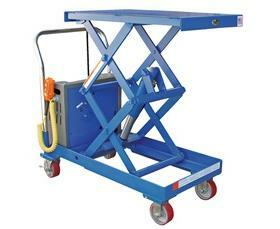 This mobile lift cart brings extra versatility to manufacturing or loading operations. 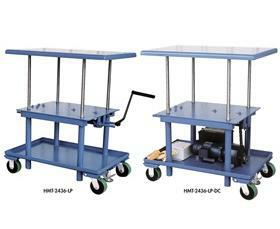 Battery operated cart lifts up to 1,000 lb. loads. 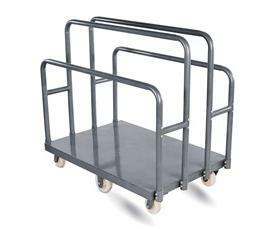 Tubular push handle for safe transport. 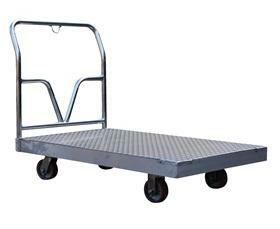 Heavy duty 5" x 2" Poly-on-Steel wheels (2 swivel, 2 rigid) for easy mobility. Swivel wheels feature locking device. Engineered for reliable service year after year. Comes standard with an DC power package. Unique design allows complete DC power unit to fit within the confines of the lift. Comes standard with hand control on 8' coil cord (extended). FOB Shipping Point. Available in AC &amp; Air. Make laundry a snap! 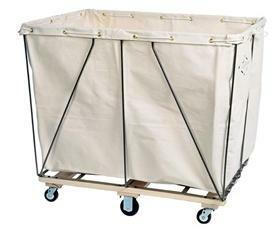 Ideal for use in many applications, including dry cleaning and commercial laundry. 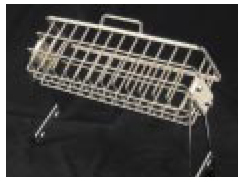 Durable, vinyl dipped wire basket. 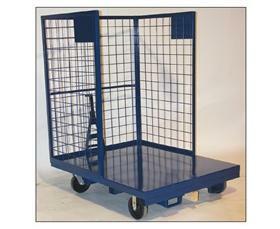 Powder coated base with 5" non-marking polyurethane swivel casters. White, PVC top rim for durability and protection of walls and equipment. Available in Canvas or Steeletex Vinyl Coated Nylon. Inside measures 42" x 30" x 30", outside measures 43-1/2" x 31-1/2" x 37-1/4". 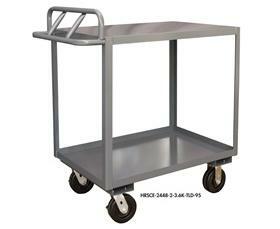 Easy rolling on 6-4" casters, 4 swivel on corners, 2 rigid in middle. Tough 1000 lb. capacity. FOB Shipping Point. 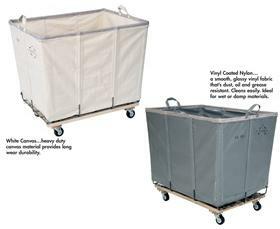 Washable vinyl truck is perfect for laundries, waste paper, parts, supplies, etc. 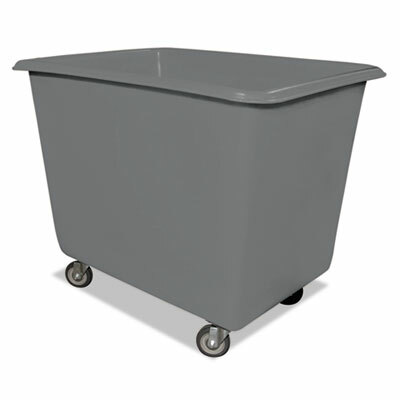 Four swivel casters provide maximum maneuverability in congested areas or narrow aisles. Rust-proof bottom. Includes stitched reinforced handles. Available in two styles. Standard color gray. Vinyl Coated Nylon available in optional colors -- please inquire. FOB Shipping Point. 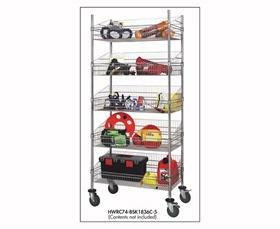 <BR><BR> See <strong>Related Items</strong> tab below for available handle and liner. 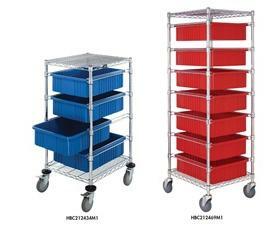 Specially designed "C" channel cradles provide increased capacity.&nbsp;3" and 4" channel frames (4,000 and 10,000 lbs. 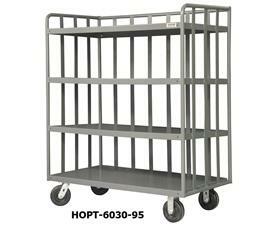 capacity respectively).&nbsp;Elevated cradles accommodate easy forklift loading.&nbsp;4,000 lb. 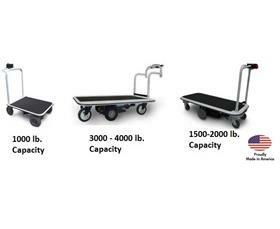 capacity models have 10" x 2-1/2" phenolic wheels (2) rigid and 6" x 2" phenolic bolt-on casters (2) Swivel.&nbsp;10,000 lb. 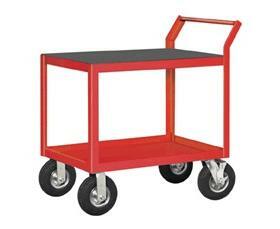 capacity models have 12" x 3" phenolic wheels (2) rigid and 8" x 2" phenolic bolt-on casters (2) swivel.&nbsp;Wheels and casters are arranged in a diamond pattern with 1/2" tilt. The truck is easily moved, loaded or unloaded.&nbsp;Gray powder coat finish.&nbsp;Shipped fully assembled and ready for work.&nbsp;FOB Shipping Point.